Infant versions of those reels that catch the larger fish in the spring, summer and fall. I’m glad you asked, because the reason is quite simple. Normally you are going to be fishing with maybe 15-25 feet of line out. There is no reason you need to haul 4 inches of line in on every turn of the reel. You just don’t need to have that much line OUT, or need to reel that much IN. When you are ice fishing you are going to need to ‘horse’ that fish up and onto the ice. Yes, I suppose they can run…you can loosen the drag…but that can lead to broken lines…tangled lines…with each other or in brush. You want power, and the micro reels have them. Another reason the reels are so small is because of the ‘throw’ of the baler. If the bail is quite large (in diameter), then it needs to sit further away from your rod. This means it will be more clumsy, and the added sweep will add unneeded friction on the guides of your rod. As a ‘test’, I put one of my walleye spinning reels on one of my broken ice fishing rods (the tip). Well, it DID work, but it was kind of hard to control while reeling up. It just felt ‘too big’. 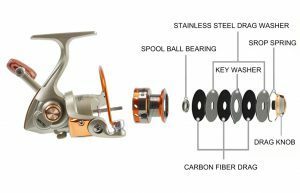 I still use it as a ‘dead stick’, but that is just me being unwilling to buy another micro reel for the broken rod. All that being said, your best bet is to buy a ‘combo’. 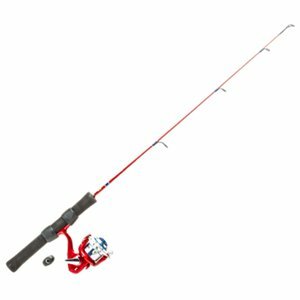 The stores usually sell a rod WITH the reel for about the same price as the reel alone. I’m here to inform the rest of the world – those that don’t have a helicopter pad on the back of their boat – about how to buy a decent ice fishing reel. 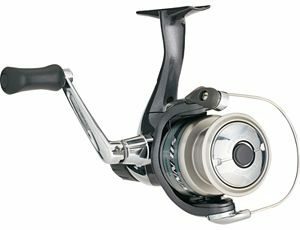 If you have the money, and you have a favorite rod, and the reel on that rod breaks, I can see purchasing a new reel. All in all, I’ve had the least problems with even the least expensive reels. I suppose the ‘drag could be a bit of an issue with the less expensive reels, but those times are just rare. So rare, I can’t imagine spending the extra money for a really expensive reel. Yes, that drag may be the reason you lose the largest fish you ever caught under the ice, but more likely it will be a faulty knot or old fishing line. You will not be using THAT expensive reel when you encounter that fish. You’ll be using the cheap one you bought because you couldn’t afford SIX expensive reels, so you bought ONE expensive one, and five cheaper ones…and when the moment comes that you finally have that large fish on the line, that expensive one will be sitting in the sled with the lure and bait that didn’t work earlier. Save your money and spend it on the two most important items: The ice fishing line and your terminal tackle.